For most people, St. Patrick’s Day is either a day when you celebrate your Irish heritage and culture or just an excuse to go out and drink more than you should. Whatever your reason for marking March 17th, this year you can add another item on your to-do list for this special day thanks to BetChain and Fortune Jack Casino. Giving you a chance to get some of that “Luck of the Irish” for this weekend, both casinos have launched new promo offers to celebrate St. Patty’s Day. First on the list is BetChain’s new Free Spins promo that will run only on St. Patrick’s Day. As the casino says, St. Patty’s is a day that can be often full of clichés. Everywhere you go you see 4-leaf clovers, people dressed in green drinking green alcohol, and Irish traditional music played through the speakers. 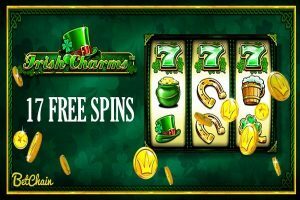 To outdo every Irish pub in your vicinity, the casino has added “a twist on every single cliche” with its new Free Spins promo. The new promotion will start and end on March 17 and will give exactly 17 Free Spins to any depositing player which can be used on the Irish Charms slot machine. And to make things even more interesting, players will be able to claim a batch of 17 Free Spins anytime they make a deposit, no limits applied. For those of you that haven’t tried Irish Charms, it is a fan-favorite at BetChain Casino that was designed by Pragmatic Play. It is a game that couldn’t be more appropriate for the occasion with its 3-reel layout and symbols of leprechaun hats, 4-leaf clovers, beer pints, horseshoes, and pots of gold. But if you want to check it out yourself before depositing tomorrow, you can always go to BetChain casino to try it out for free. If you’re looking for even more Irish fun, Fortune Jack Casino is also running a special promotion for the weekend to mark St. Patrick’s Day. With 3 Irish-themed slots tied to the offer and €3,500 in cash prizes for the luckiest players, this promo offer can get you warmed up for St. Patty’s unlike anything else. The St. Patrick’s Day promotion is a prize draw that began yesterday, March 15th, and will run until Monday, March 19th. To enter the prize draw, you will have to wager €2 in BTC equivalent on either the Lucky Leprechaun or the Lucky Clover and Stacks O’ Gold slot games. With each wager that meets this requirement, you will get 1 point for the draw. The top 100 players with the highest number of points will then be selected for the prize raffle that will hand out 31 rewards. The luckiest player of them all gets to claim €500 in BTC while the remaining 30 players will all get €100 from the casino. All winners will be announced on Tuesday, March 20th, while the leaderboard will be updated every hour. If you want to see whether you too have that Irish luck, just go to Fortune Jack and start playing!